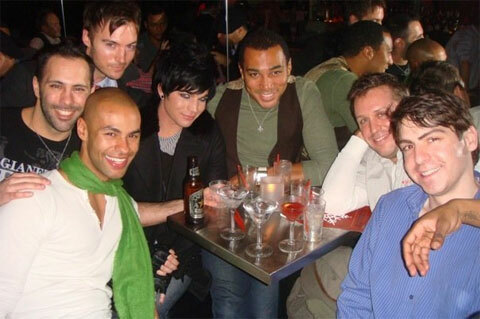 Adam Lambert made show tunes night at Splash bar in NYC a bit gayer last night. Towleroad received these photos from reader Len Evans of Lambert, his group, and fans (above), and Splash promoter Dougie Meyer (below). A poster to the forums at Broadway World gushes: "What I thought was just going to be a regular night at Musical Mondays at SPLASH Bar turned-out to be pretty exciting. Around 9:30pm, none-other-than Adam Lambert himself comes strolling in! With about 3 friends, he moved to the back of the bar into a booth. And… a million cell phones immediately whipped out texting friends and updating their Twitter/Facebook statuses. I got the balls to walk over and say hi (thanks to a great friend who pulled me into the booth). He is much skinnier than I thought he would be. Glam black make-up. Black crow hair coiffed to high-heaven. Black fingertip-less gloves, black shirt and pants, long dangly chain around his neck…. (Love child of Liza and Joanne Worley?!) BUT SOOOO SWEET IN PERSON! I introduced myself and friend as members of the NYC Gay Mens Chorus (we were flyering the tables). Told him I was there when he got accepted at his San Francisco audition (laughed that he went skipping down the street). Then asked him why he was in-town. He is taping THE VIEW tomorrow but was sad that Whoopi wasnt going to be there. I told him to slap Elizabeth for us. He joked that he was going to be really condescending and call her Lizzie during the interview. Soooo sweet and surprisingly receptive to fans saying hello. He left around 10:15pm, hugging/kissing fans on the way out."